Former Scientology spokesman Mike Rinder recently reported that church lawyer Gary Soter had sent a threat letter to former Scientology executive Dan Koon. The church had learned that Koon helped Ron Miscavige Sr., the father of Scientology leader David Miscavige, write his memoir, which is due to come out in 2016. In his letter, Soter informed Koon that by merely helping Ron write his book, he was in violation of nondisclosure agreements and bonds he had signed as a Scientology officer. Those documents Koon had signed carried heavy penalties for violating their terms, Soter claimed. Sea Org members make about $40 per week — when they’re paid at all — but Scientology expects its indentured servants to pay a $5,000,000 penalty for breaking the Sea Org’s rules. What really stood out, however, was something else Soter included in his letter. Can you spot it? Plaintiff asserts that Mr. Miscavige exercised control because he leads the Sea Organization, a religious order within Scientology. But the ‘Sea Org’ is not a corporate entity; it has no physical or legal existence. It is not incorporated or established pursuant to legal formalities. It has no constitution, charter or bylaws, and no formal or informal ecclesiastical, corporate, or other management structure. It has no directors, officers, managing agents, or other executives; no employees, staff members, or volunteers; no income; no disbursements, no bank accounts or other assets; no liabilities; no stationery; no office, home, address, or telephone number. It does not create or maintain any financial, personnel, or other records. It can neither give nor receive orders because it has no one to either give or receive them or to carry them out. It cannot sue or be sued. Although there is no such “organization” as the Sea Organization, the term Sea Org has a colloquial usage which implies that there is. There are general recruitment posters and literature for “The Sea Org” which implies that people will be employed by the Sea Org when in reality they will join, making the billion year commitment, at some church that is staffed by Sea Org members and become employees of that church corporation. So, while Scientology tells courts and governments that its Sea Org has no legal reality and no members, it tells Sea Org members like Dan Koon something very different. The Sea Org has no members. But Deixler told a California court that the senior leadership of Scientology is drawn “exclusively” from the Sea Org – a group that Mr. Jefferson told a Texas court can have no directors, officers, managing agents, executives, employees, staff members, or volunteers. — In order to keep David Miscavige out of a deposition in a Texas lawsuit, Scientology claims that the Sea Org does not exist and has no members. Sea Org members derive authority only from their posts in the Church of Scientology hierarchy. — In order to threaten Dan Koon, Gary Soter asserts that the Sea Org and its contracts exist, that they are legally binding; and that they can serve as the basis of a lawsuit to collect $5,000,000 in liquidated damages. — In order to claim First Amendment protection for its abusive treatment of employees, Bert Deixler said in Laura DeCrescenzo’s lawsuit that all of Scientology’s senior executives are drawn from its monastic order the Sea Org. As I wrote in a previous column, this “ministerial exception” is why Sea Org workers do not have to be paid minimum wage or overtime; why they can be locked up and brutalized in the Rehabilitation Project Force; and why they receive no pension after decades of service. Scientology has been able to subject its workforce to endless hours, sleep deprivation, unhealthful food and psychological terrorizing, and American courts have been reluctant to do anything about it. The Church sees Sea Org members as “coins” that can be traded among Orgs and then kicked to the curb when they weaken from age or infirmity. The Sea Org euphemism for this cruelty is called “Fitness Boarding.” Old and sick Sea Org members are fitness boarded, given $500, and then shown the door. The Church of Scientology’s justification for its humiliating and sadistic treatment of Sea Org workers is the First Amendment. However, when Captain David Miscavige of the Sea Org is at risk of being deposed, the Sea Org does not exist. The Church of Scientology should not be able to have it both ways: A legally nonexistent entity cannot have First Amendment protections. Thus, we turn Mr. Cooley’s question to David Miscavige and the Church of Scientology: Does the Sea Org exist or does it not exist? Which story are you sticking with, Mr. Miscavige? 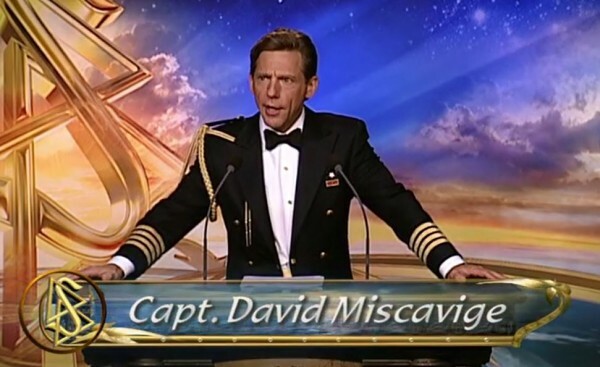 Captain David “let him die” Miscavige just hired 2000 lawyers to define how the Sea Org does not exIst, and how he has never heard of this thing called Scientology.